There are 12 Green Flag winners in Bristol this year. The Green Flag Award Scheme covers the whole of the UK and recognises well-managed, high-quality green spaces. Any green space in the UK is eligible to win this award providing it is freely accessible to the public. Parks Forum member Snuff Mills Action Group has for the second time been awarded the Green Flag Community Award. The Community award is for green spaces in the UK that are managed by voluntary and community groups. In addition Bristol Parks has been awarded 11 Green Flags for parks throughout the City that it manages. Community involvement is an important part of the Green Flag Award scheme, so the various Parks Groups involved in these parks have played a major part in the City winning these awards. 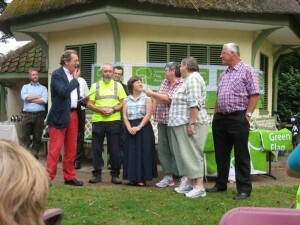 The certificates for the 11 parks were presented by Mayor George Ferguson at Blaise Castle Estate this morning. 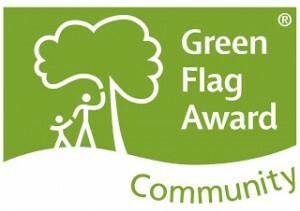 To see a more detailed description of the criteria visit the Green Flag Award website. The Green Flag Award Scheme is licenced to Keep Britain Tidy by Communities and Local Government (DCLG) who own the green Flag Award Scheme. The scheme was set up in 1996. This entry was posted in Awards, Bristol City Council, News. Bookmark the permalink.